A new online casino is always fun but this is something extra. Even though Late Casino is a new platform, it is already looking like a well-known online casino. The casino has a dual license from the Gambling Commission in the UK and the Alderney Gambling. This makes it a safe platform where players can be assured of fair and responsible gambling. Also, Lost Casino fully supports mobile gaming. Hence, players can easily access their wide selection of games from both Android and iOS devices. Meanwhile, there is a lot more to see from Late Casino. The platform features a massive game library. Their selection of games is just above 700. Meanwhile, these games are carefully selected from your preferred software providers. While all these sounds cool let’s explore Late Casino to see why it is a great place for Irish players to enjoy quality online gambling. There is nothing new or special about the welcome bonus at Late Casino. if you know Jumpman Gaming, then you’d know that their welcome offer is always the same thing. Hence, Late Casino offers the same option for players to spin the mega reel for either extra spins of a shopping voucher. So, all you have to do is make a minimum deposit of €10 and you get that chance. The welcome casino bonus is a one-off activity so you might want to consider the deposit amount properly. Players who receive the €10 Amazon voucher can use it to make purchases. However, players who receive the extra spins still have a lot of work to do in order to convert it into withdraw-able cash. After converting the extra spins to cash, meeting the huge wagering requirement of 65 times is another mountain to climb. Turbo Reel: The turbo reel is where all the prizes are kept. However, you need to spin it to win and Late Casino is randomly offering players that rare chance to win between 50 to 500 extra spins. Meanwhile, the winnings from the extra spins must also be wagered a minimum of 65 times with the same maximum conversion of €250. Newbies Cashback Boost: It’s simple. During your first month as a new player, Late Casino will refund new layers a certain percentage of their total deposit. Happy Hours: during the specified time from 3 to 7 PM of the selected day, Late Casino offers players the chance to win up to 500 free spins. The wagering terms and maximum conversion remains the same. 200 Club: This is strictly for players that have gathered as much as 200 trophies on Late Casino. Automatically, you qualify to get your share of the more than 20,000 available extra spins. Although the selection of the games on Late Casino is mainly new slots, they also feature a wide array of games in other categories. Late Casino features Bingo games such as Free Bingo; Lucky Stars; Pay day jackpot; Fair and Square; VIP free Bingo etc. likewise, their selection of Jackpots include Stampede Jackpot; Temple of Iris Jackpot; Fluffy Favourites Jackpot; Enchanted Prince Jackpot; Sugar Train Jackpot; Shaman’s Dreams Jackpot, etc. 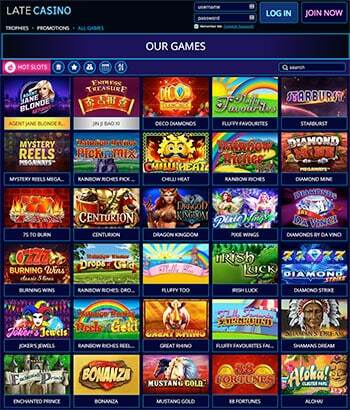 Finally, while slot does dominate, here is a summary of some of the hottest slot games: Age of Discovery; Lucky Leprechaun; 3 Genie Wishes; Fluffy Favourites; Irish Luck; Deco Diamonds; Jin Ji Bao Xi; Chilli Heat; Starburst; Rainbow Riches; Gonzo Quest, etc. The games on display are courtesy of top providers such as Microgaming; red Tiger; Lightning Box; Yggdrasil; NextGen Gaming; Rabcat; Red Tiger; NetEnt; Evolution Gaming; Blueprint and many more. Late Casino is a PayPal online casino because it does offer PayPal as one of its payment alternatives. This is certainly a talking point on Late Casino as there are not many online casinos that offer such classy payment option. In addition, players can also use MasterCard; Entropay; Maestro; Visa; Pay By Phone; Paysafecard and a few other options. In all, there are not many alternatives. However, late Casino integrates only the best, safest and fastest payment options. The FAQ section at Late Casino is quite detailed. A lot of topics were treated. However, the support team is also available only from 9:30 am to 6 pm. This is certainly one of the shortest time frames for online casino support. However, this is for players who want to use the live chat feature. However, players can send their emails anytime as they will receive a response within 24 hours. Late Casino has plenty of games. The games are also available on mobile devices and Late Casino also includes a number of mobile-friendly payment options. This makes is a great place for Irish players to enjoy the best selection of mobile games.